Diocesan deacons stand outside the Cathedral of the Sacred Heart waiting for mass to start. Wow. It feels great to sit. Today was a busy day taking photos for the Diocese of Richmond at the annual Chrism mass. This mass is when the Bishop blesses the Holy Oils to be used for Sacraments throughout the year. I took over 400 photos at the mass. It was amazing to have an up close view of everything happening and getting to experience something wonderful. There were so many things to photograph and so many people there experiencing something for the first time. This was His Excellency, the Most Reverend Barry Knestout's first Chrism Mass not only in this Diocese but his first ever. All the priests and many of the deacons from across all of Virginia were there tonight. The Bishop pours and mixes the perfume in the oil to make the Sacred Chrism. 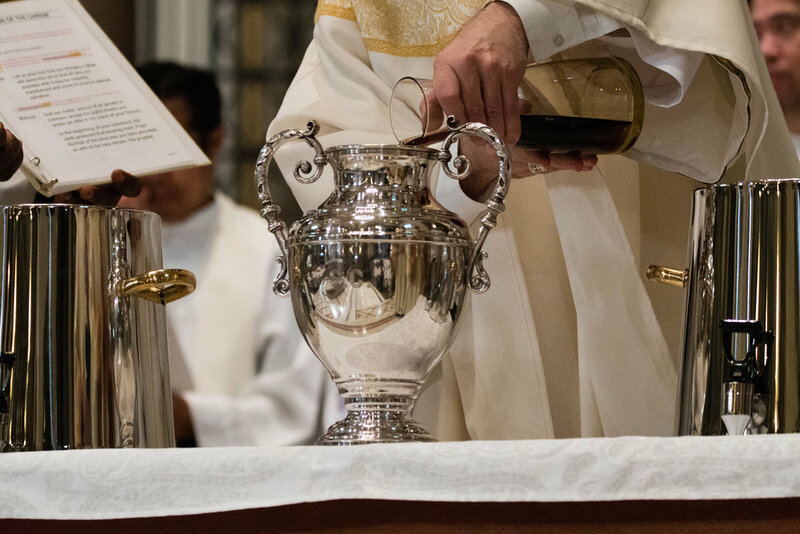 Part of the mass provides an opportunity for the priests to re-commit themselves to the priesthood. It's amazing to see these holy men willing to serve. Photos are my way to serve and then share them with you. I am looking forward to a few days off so I can rest and get ready for Holy Thursday where there will be even more opportunities for some wonderful photos. I look forward to sharing those with you.